Quite often we get requests to supply toys that are going to be used for a promotion or a display and we have had items shown on television programmes but I believe one of the most interesting has to be from the Harvest Committee of a Church Sunday School which required 50 of our plastic watering cans. 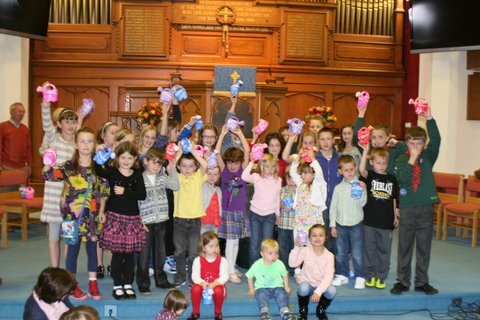 They informed us that the watering cans were to be used by the children to raise money at their Harvest Festival. Money raised would go towards the 'Turning on the Tap Appeal'. This is the re-launch of the campaign for clean water launched by Christian Relief and development charity Samaritin's Purse which originated four years ago. The aim is to give cleaner drinking water to the 1 in 8 people in the world who still don't have access to it and suffer from water-borne diseases. I remember when I was around the age of ten visiting my grandparents who lived in an old cottage in the corner of a field not far from the village I lived in. They had no running water but there was a small spring which ran into a little hand dug pool across the lane from them. From there they would fill buckets but when the spring ran dry in the summer my grandad would walk down through two fields to the river where he would fill a couple buckets and walk back to the cottage doing this several times a day. On the times when I visited them it seemed great fun to me having to trudge through the fields for buckets of water but I am sure my grandad found it tiresome and we had to stop every now and then for him to rest. There were days we would take a picnic and sit by the river but we still had the long trek back up the two fields with the buckets of water and some weeks my grandad would do this time and time again day in and day out. In our modern society of today this is almost unheard of and how many of us complain when our water is turned off for a few hours for a pipe to be repaired or they are frozen for a few days in the winter. We just expect to do nothing more than turn on a tap in our home and sparking clean water to come out endlessly every time. Imagine walking several miles every day to find water and even the water you collected was more than likely to be contaminated and filthy. Imagine your children having to do this as well just so they had some water to drink. It doesn't bear thinking about. Funds raised by the 'Turn on the Tap' appeal are directed towards the water and sanitation projects of Samaritan's Purse in Liberia, Mozambique, Niger and Uganda. Here broken boreholes are repaired, new shallow wells are dug, community latrine blocks are built and bio-sand water filters are provided for homes to filter their water. Please spare a few minutes to watch the video and the next time you turn on your tap remember how fortunate we are.